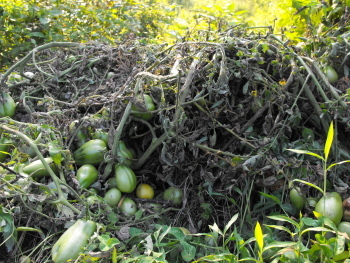 Our tomatoes are now just a big blob of twisted and mangled branches in a few piles outside the garden. The blight took hold pretty strong here. We're holding off on deleting the tommy toe varieties in hopes of getting some more healthy ones before the blight robs them of all their delicate juices. It was just too depressing to think of watching them die a slow death over the next few weeks. This way we can double down on some fall peas and other Autumn crops.